As Charlotte's brewery scene booms, local craft beer has become a favorite at weddings. But now, couples have another local option: grain-to-glass vodka. That's where Charlotte's new distillery, Doc Porter's comes in. Owned by Andrew and Liz Porter and named for Andrew's grandfather, Dr. Richard Porter, the distillery has become a tour destination and its vodka-made from grain grown in Marshville-is now sold at area ABC stores ($29.95 a bottle). The husband-and-wife team plans to release gin in a few months. 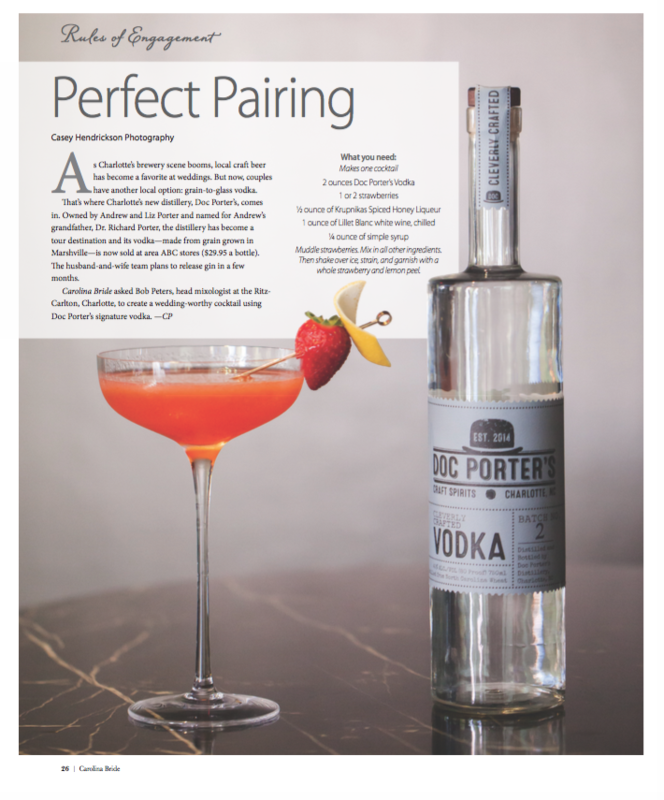 Carolina Bride asked Bob Peters, head mixologist at the Ritz-Carlton, Charlotte, to create a wedding-worthy cocktail using Doc Porter's signature vodka. This entry was posted in Press and tagged article, bartender, best, Best Bartender, Best cocktail bar, Best mixologist, Bob Peters, bob the bartender, bobthebartender, Carolina Bride, Carolina Bride Magazine, Charlotte, cocktail, Cocktails, Doc Porter's Vodka, Local, punch room, punch room ritz, the ritz charlotte, The Ritz-Carlton.